September is here, which means the annual marathon of Jewish holidays is just around the corner. All over the world, Jewish cooks are planning menus and working out who to invite over for which celebratory meal. 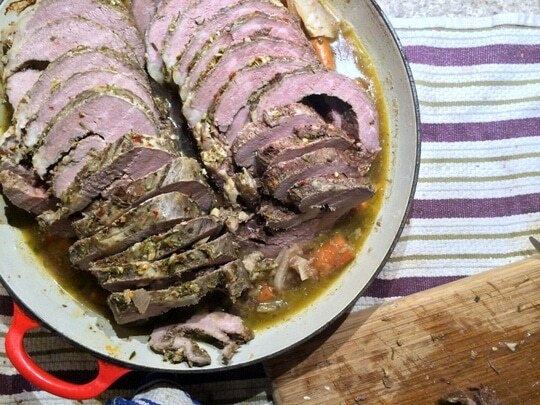 Some of our California family are flying in for Rosh Hashanah, the Jewish New Year, but I’m not planning a traditional brisket dinner; although my Pesto Brisket Recipe might make the cut. We’ve got something much more interesting; Top of Rib Roast. Doesn’t that look delicious? All those juices are straight from the meat itself, no stock or additions. After all, when you’re working with the best ingredients, you really don’t need much at all. This top of rib roast comes direct to the door from KOL Foods, the nation’s only supplier of organic, kosher and pasture raised meat that is exclusively grass fed. 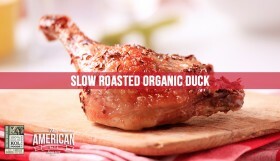 There are some other organic and kosher meat options, but KOL Foods are the only ones that promise not to finish their meat and poultry on grain. This meat is grass fed from beginning to end and you can really taste the difference. Although top of rib roast is a delicious and flavorful cut of meat, it seems to be shadowed by the briskets and chickens of the holiday menus. I urge you to reconsider because this cut is a hidden gem. I really wanted to bring out the flavor of the meat with natural ingredients, so I reached out to my buddy Chris to check how he made the Bone in Rib Roast that we shared with Simon Majumdar at our Fed, White and Blue Shabbat Dinner. Olive oil, rosemary, garlic and red chili flakes with a touch of salt and pepper made the perfect rub for this meat. Fresh rosemary pairs wonderfully with top of rib roast. I combined the rosemary, garlic, red chili flakes and salt with the very last of my olive oil from Dry Creek Olive Oil Company. I had been saving the oil for the perfect dish and I think this was the right decision. If you’re used to omitting salt from your kosher meat recipes, I beg you to include it. Just a pinch, it will bring together a lovely marriage of flavor. You could add a small sprig of fresh thyme (but just a touch) if you have it lying around but it’s not essential. This herb oil smells amazing. I’ll bet it’s great as a dipping oil with fresh bread. Once you’ve covered the meat, on both sides, with the olive oil herb rub, roll it back up, put it in a braiser and let it sit for at least 30 minutes. 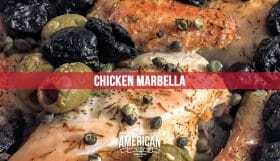 Ideally, you’ll leave it overnight, refrigerated, so the flavors can really be absorbed by the meat. And savor the smell, that herb rub will play magical games with all of your senses. Always allow the meat to rest for before slicing. 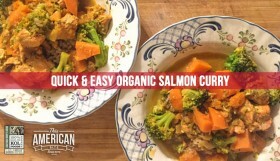 This dish is a great make-ahead recipe too. When it comes to cooking, you’re going to crank up the oven to 350 for 20 minutes to get a nice crust on the outside of the meat, then you’ll cover it and cook it low and slow on 200 degrees for 18 minutes per pound. Before you finish cooking, check the internal temperature with your meat thermometer to check it’s reached 165 degrees. Kosher Top of Rib Roast Recipe – delicious hot or cold. 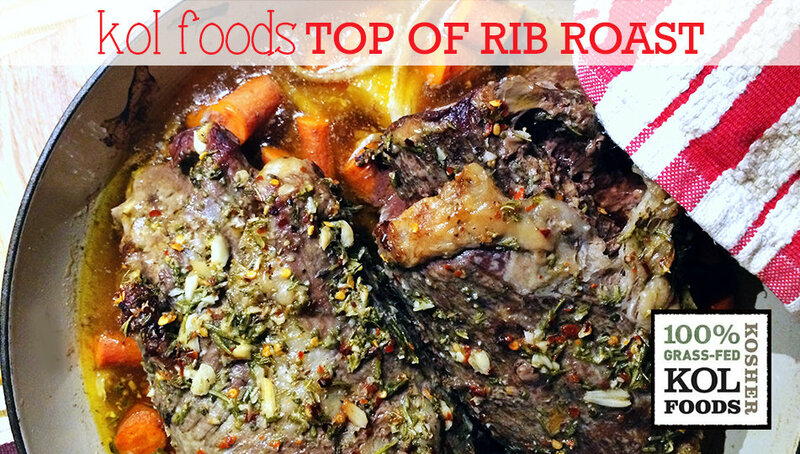 This top of rib roast is amazing fresh from the oven but always let your meat rest before you slice it. Letting meat rest before you cut it isn’t a myth from Grandma’s kitchen. Meat needs time for the muscle fibers to relax. If you cut into the meat too soon, the muscle fibers won’t be able to hold on to those flavorful juices so they will spill on to your cutting board leaving the beef dry and hard. Once sliced, this sliced top of rib roast also tastes great cold, so make plenty so you have leftovers for sandwiches. Or make two (three, or four) at a time so you have one for dinner and another for the next day. And be sure to save all those natural juices for stock or gravy another time. Seriously, keep those juices. Take your top of rib roast out of the fridge about 20 minutes before you start to prepare so it can reach room temperature. 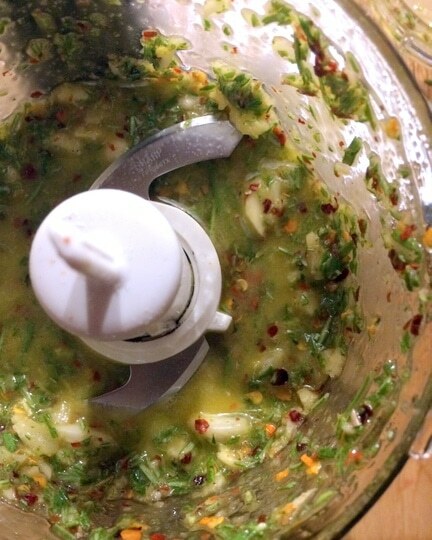 Mix the garlic, rosemary, red chili flakes with a generous pinch of salt and black pepper. Mix with 2 teaspoons olive oil and cover the roast with your spice rub. Slice your onion, put it in the bottom of a braiser, peel the carrots and parsnips and cut into 1 inch chunks. Place the roast on top, and put it in a pre-heated oven at 425 degrees for 40 minutes. Then cook at 275 degrees for 20 minutes per pound. 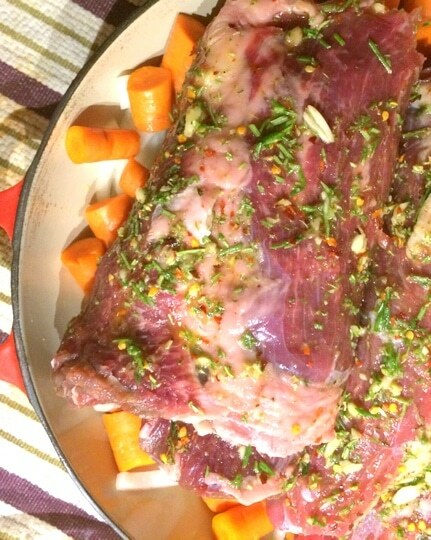 Once the roast has cooked, remove from the braiser and let it rest for at least ten minutes before slicing. Here’s the optional wine part. 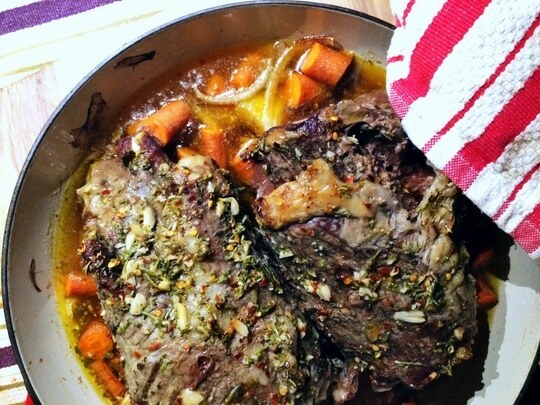 While the roast is resting, deglaze the pan with the wine or broth. Slice the roast and return to the pan for serving. 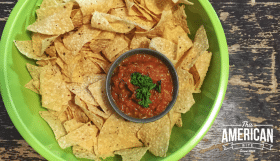 Share this recipe with friends or family. 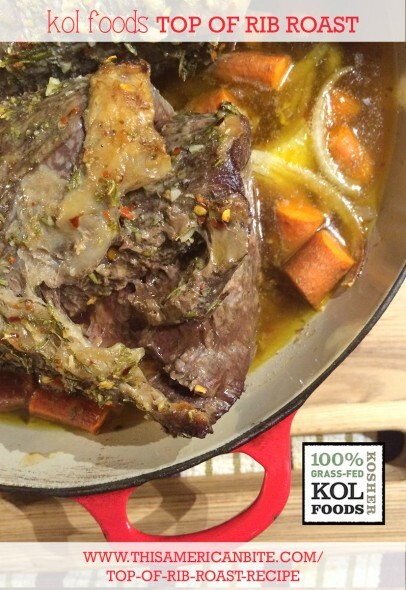 KOL Foods puts kosher meat and ethics on the same plate so you can feel good about the meat you eat. Every day the KOL Foods team work to create an honest, transparent food system that treats animals humanely, supports sustainable animal production, treats farmers and workers fairly, and improves the health of families and communities. Their gold standard: animals raised humanely on pasture enjoying their natural diets on sustainable farms, where the environment, health and concern for the community are paramount. As a values-based business, we produce food that is in harmony with nature, neighbors and tradition – all the way from farm to fork. And the results are delicious! These are the meals a I have created using KOL Foods meat, chicken and fish.